Who Suffers When Minimum Wage Increases? Empirical studies on the matter carried out here in Canada are unequivocal: Raising the minimum wage leads to increased unemployment, especially among the young, who have less experience and qualifications. Man in pin stripe suit using a magic wand to create wealth. Effective May 1st, the minimum wage in Quebec reached $10.15, a 25¢ increase. Nova Scotia and the Yukon raised their minimum wages a month earlier, to $10.30 and $10.54 respectively. Across the country, only Alberta, at $9.75, now remains below the ten-dollar mark. Unfortunately, while minimum wage laws may be motivated by laudable intentions, the fact of the matter is that they do not actually help those who need it most. On the contrary, such laws end up hurting the very people they are meant to help. When employers are coerced by politicians to offer wages above the productivity level of workers, they need to compensate somehow. They may lower non-monetary benefits, or simply reduce their workforce. And you can bet that if they're forced to pay more per worker, they will gradually try to substitute unskilled employees for higher skilled workers and even automated production processes. The least experienced and least qualified -- the people who are supposed to benefit from the wage hikes -- will be the first to be let go, and will find it harder to get replacement jobs. Empirical studies on the matter carried out here in Canada are unequivocal: Raising the minimum wage leads to increased unemployment, especially among the young, who have less experience and qualifications. A group of researchers has recently sought to estimate the impact of minimum wage increases between 1981 and 2004 on the employment of young Canadians. They found that a 10 per cent increase in the minimum wage led to a 3 per cent to 5 per cent drop in employment among the youngest. Hence, it is no coincidence if the current unemployment rate in Canada is twice as high for 15- to 24-year-olds (14.3 per cent) as for those aged 25 and older (6 per cent). Contrary to widespread belief, a minimum wage policy does nothing to improve the lot of the poor. In fact, the job losses resulting from minimum wage increases do disproportionately affect them. 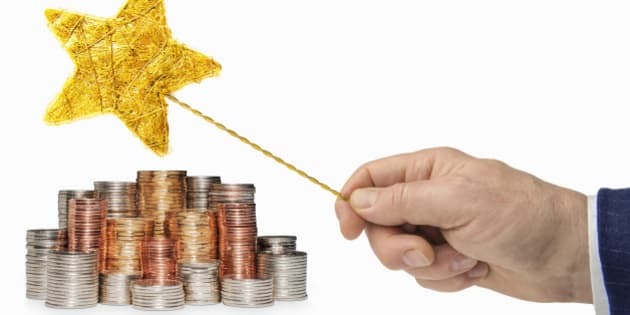 According to the above-mentioned study, a 10 per cent hike in the minimum wage is also correlated with a 4-to-6 per cent increase in the percentage of families living under Statistics Canada's Low Income Cut-offs (LICOs). Hence, as three Canadian economists who looked into the matter wrote recently, "Political rhetoric notwithstanding, minimum wages are poorly targeted as an anti-poverty device and are at best an exceedingly blunt instrument for dealing with poverty." Clearly, the minimum wage is not all it's cracked up to be. Far from being an unalloyed good, raising it involves a trade-off: For all of those who benefit a little from a higher wage, there are many who suffer a lot from a job loss. Sadly, minimum wages keep going up almost everywhere because the positive effects are easy to see, whereas the negative effects are more difficult to perceive. And there's nothing politicians love more than policies with benefits that are seen and costs that are unseen. 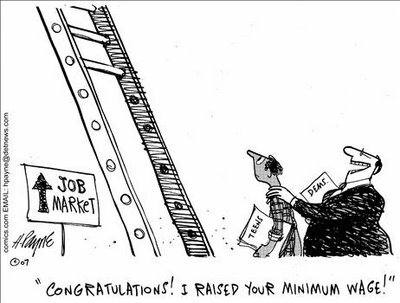 A minimum wage increase is a poor tool for helping those at the bottom of the ladder because far from giving them a leg up, it removes the lowest rungs of that ladder. Surely we can find a better way to help the vulnerable than by pricing them out of the labour market.